Department of Electrical and Electronics Engineering is one of the first departments at BITS Pilani, Dubai campus established in the year 2000. The department is dedicated to the teaching and research activities in the areas of Electrical, Electronics , Instrumentation & Control and Communication Engineering. The department educates the students to take up challenging jobs in a wide range of industries and engage themselves in research and development activities for the good of society. Courses offered by the department cater to learning needs from basics to the advanced level. Department offers variety of discipline electives and covers most of the modern technologies. It has state of the art laboratories to provide hands on experiences and support research activities. Department has Association of Electronic Engineers (AOEE) and Intelligent Flying Object for Reconnaissance (IFOR - Team) for students related activities. Faculty is involved in the research at first degree, higher degree and doctoral levels. They publish their research work in reputed international journals and conferences. 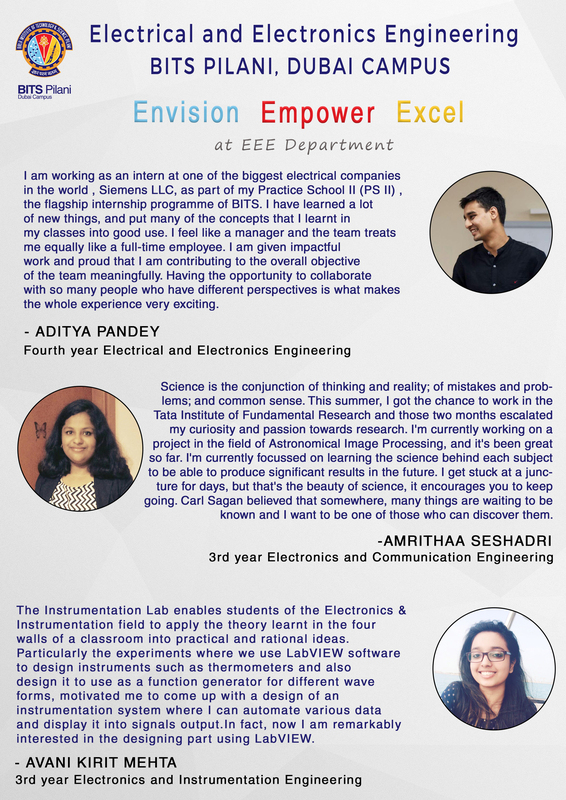 Students are motivated to take up research and development activities notably in the area of Electrical, Electronics, Instrumentation and Communication Engineering. Key research areas in the department are Power Electronics, Power systems, Microelectronics, Embedded systems, Digital Signal Processing, Image processing, Process control, Instrumentation and control, Bio medical Instrumentation and Communication systems. Students have brought honor to the department by their research work, some of them have received awards for the best research paper. Dedicated and hardworking faculty and technical staff are the strength of the Electrical & Electronics Engineering department. The department has a rich blend of faculty with industrial and teaching experience. Most of the faculty in the Department are Ph. D. from reputed Indian or international universities and have expertise in conventional and emerging areas like Electrical Machines, Power Systems, Power Electronics, Digital Systems, Process control & Instrumentation, Bio medical Instrumentation ,Embedded Systems, Image Processing, Communications systems, Wireless Communications etc.. The breadth and depth of the expertise of the academic staff ensures high standard of class room teaching and provides excellent opportunities for the students to do challenging and stimulating projects and research. The courses are well supported by the laboratories and dynamic laboratory instructors.